Canadian Mining Magazine is a major voice within Canada’s mining industry. Three times per year, the magazine is direct-mailed to a mailing list that is made up of the “who’s who” in the industry; major mine executives and CEOS, venture capitalists, investors, researchers, mining association representatives, university and college mining program administrators, and many more. We work very hard with our industry contacts and writers to ensure that the magazine covers the stories that this calibre of reader will find interesting and relevant. The magazine is also widely distributed at both Canadian and international trade shows and events throughout the calendar year. 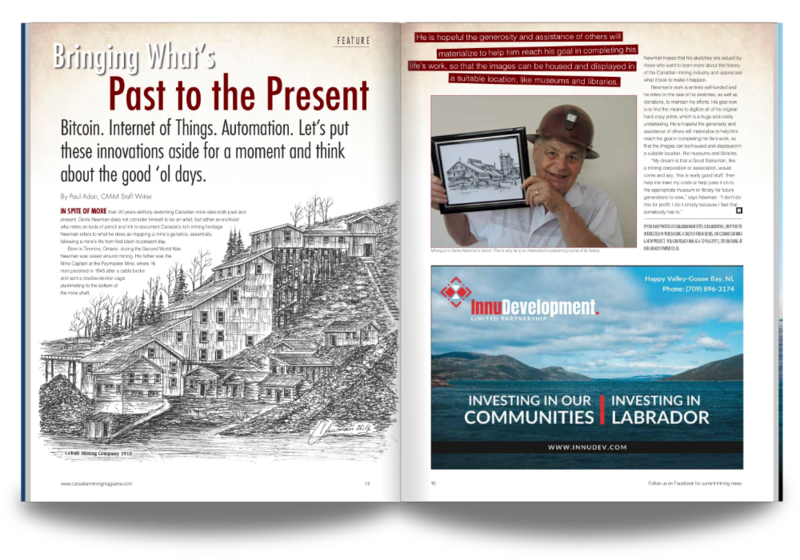 Greetings: Starting in the Winter 2018 edition, each magazine will feature an opening message from an industry-related entity, including mining associations, political leaders related to the industry, or mining companies that have a story to share. 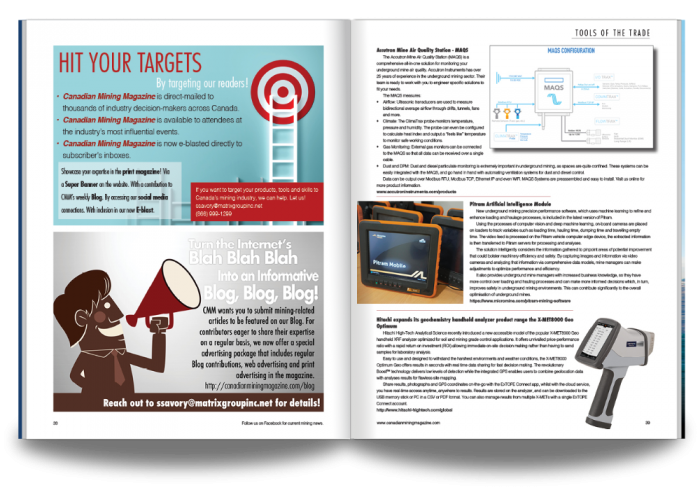 Check with your sales rep to see what’s planned for upcoming issues – these are great must-read articles to purchase advertising space next to! In-depth coverage that zeroes in on the latest hot-button industry topics: These stories cover various topics issue to issue, focusing on what’s new and trending in Canada’s mining industry. Topics often include economic outlooks, labour forecasting/HR topics, legislation updates/political changes, equipment maintenance articles, and industry-related safety stories. They are often contributed by experts in the industry. Departments: Each issue includes a special Tools of the Trade section that highlights new products, machines and tools relevant to the industry. Each edition also showcases upcoming industry events, including (but not limited to) those that Canadian Mining Magazine is partnering with. In-depth articles on industry issues! Each issue of the magazine includes feature articles on industry topics of interest to our readers. Ask your sales representative for information on the features planned for the upcoming issue. 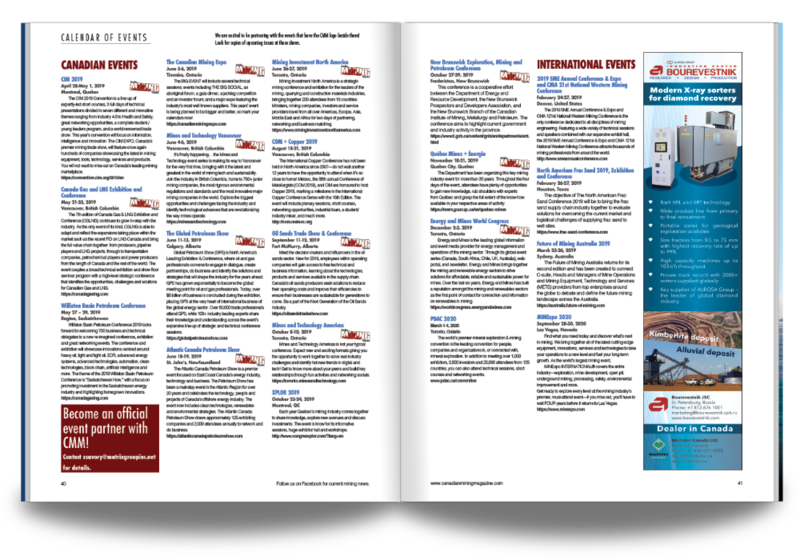 Each issue of the magazine includes an updated list of mining events that are upcoming across Canada and around the world. It also highlights those we are partnering with. Each issue of Canadian Mining Magazine features the latest new products on market, including software, tools and heavy machines. Each issue also outlines upcoming industry events, both Canadian and international. THE NEXT ISSUE HITS MAILBOXES IN SEPTEMBER! REACH OUT TO BE A PART OF IT!